The Common Core is requiring literacy across the curriculum, but what does that mean for teachers of subjects like math, science, and social studies who have a lot of content to cover? In this essential book, author Jessica Bennett reassures you that you don't have to abandon all of your great content lessons and start from scratch. Instead, you can reflect on what you`re already doing well and make adjustments and enhancements as necessary. Bennett starts with a clear breakdown of the Common Core ELA Social Studies/History and Science and Technical Subjects Standards for Grades 7-12 and what they actually look like. She provides a variety of practical strategies and scaffolds that you can use immediately to enhance your curriculum and meet the standards. Throughout the book, you'll find tools such as unit planning sheets, daily lesson plan sheets, classroom handouts, sentence starters, and more. 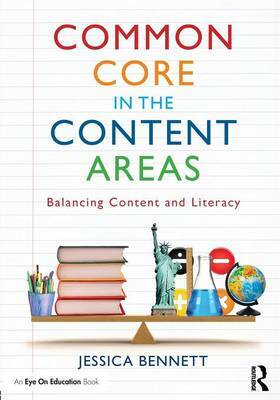 If you teach a content area, this must-have resource will help you meet the Common Core with ease! "This book, Common Core in the Content Areas, challenges teachers in the content areas, especially History and Science teachers, to evaluate the Common Core standards for English and get students to think. The author, Jessica Bennett, offers specific tips for teachers to successfully adopt these standards. This book is going on my shelf." "What a terrific resource! Jessica Bennett's text will enrich educators' understanding of the Common Core State Standards and provide a road map for designing lessons that foster literacy. The theory and instruction in this book will help educators to teach students to succeed not only with the standards, but in life beyond the classroom." "Thanks, Jessica! As a science teacher, I truly appreciate this book. I enjoyed reading it and I am especially grateful for all the planning sheets. This has encouraged me and has simplified implementing more Common Core strategies into my lesson plans, as I am certain it will others in our profession."